Help provide clean water to families around the world. Water scarcity can take an immediate, physical toll on entire communities and many families around the world lack critical access to clean and safe water. Without clean water, families are prone to disease and farmers cannot adequately support their livestock and crops. Cross Catholic Outreach is partnering with Bishop José Grullón Estrella at the Catholic Diocese of San Juan de la Maguana to build clean water systems in the rural areas of the Dominican Republic. These new systems will reduce waterborne illness, ease the labor burden on women and children, and help farmers irrigate their land to improve the volume and variety of their crops. The project we’re working on together will construct 6 water systems, pipe water to 800 households, impacting 3,000 people in need. Today, you can partner with us to not only help provide clean and safe drinking water to families in the Dominican Republic, but to other impoverished families in countries like Bolivia, Ethiopia, Guatemala and more! Sunilda de Beltre keeps burning the family’s meal of beans. It’s not because she’s a bad cook. She just doesn’t have enough water to fill the pot. Sunilda’s lack of water isn’t for lack of her laborious efforts to gather it. Several times a day, the mother of four straps her youngest on her back and goes out to fill her containers with water from the nearest creek. During the dry season, the situation is much worse. The water table drops, and Sunilda and her neighbors are forced to dig holes in the dry creek bed and wait for murky water to seep up and fill the cavity. After all this work, the amount of water is still too little for cooking, cleaning or farming — and it’s contaminated and risky to drink. 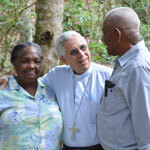 Sunilda’s community in the Dominican Republic will be one of the beneficiaries of a new water system. Her family and her neighbors will soon have clean, safe water right in their home. Learn more about other water projects around the world. View all project categories and regions around the world. Read more about Bishop José Grullón Estrella on our blog. Get the latest news and updates on how we’re transforming the poor and their communities. Proceeds from this campaign will be used to cover any expenditures to provide clean water incurred through June 30, 2019, the close of our ministry’s new fiscal year. In the event that more funds are raised than needed to fully fund the project, the excess funds, if any, will be used to meet the most urgent needs of the ministry.